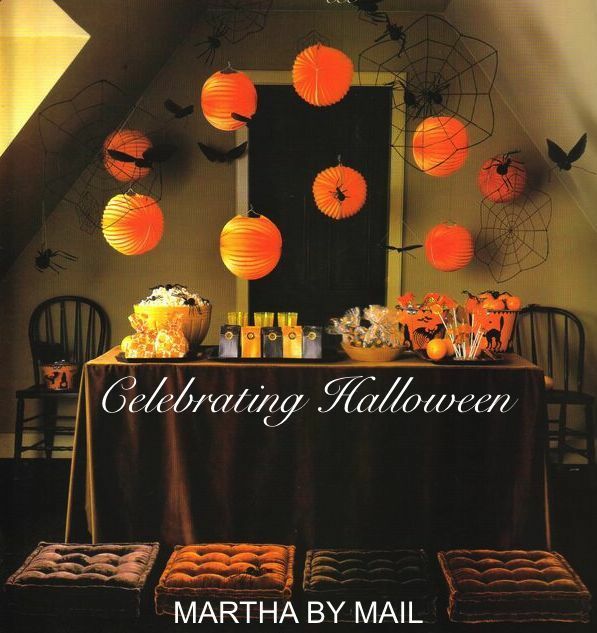 Celebrating Halloween with style is easy when you turn to the former Martha by Mail catalog for inspiration. From decorating your outdoor spaces and choosing what to give to your ghoulish guests as party favors, to creating a macabre indoor atmosphere for your bewitching celebration and finding the perfect costume for the little goblins in your family, the past Martha by Mail catalog continues to serve as a source of ideas for many of us. 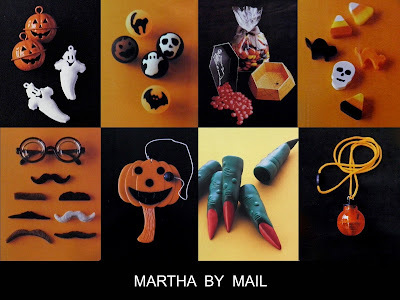 I decided to make it easy for all of you who love collecting Martha by Mail and adore celebrating Halloween, by combining the best ideas that were once a part of this now-closed catalog. 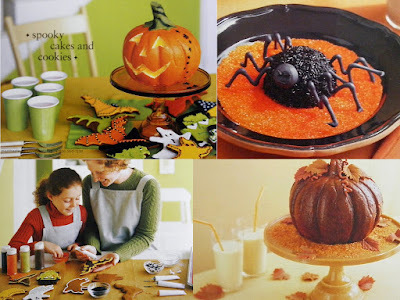 Although many of these exclusive products are no longer available, you can still get creative this Halloween by crafting, baking, decorating and arranging in the same manner, with present-day, easy-to-find materials. If you happen to have some of these products or collect vintage and antique Halloween memorabilia, by all means use them! Here you will find ideas for party invites, party treats, costumes, decorating your spaces, carving pumpkins, baking cakes and cookies, as well as choosing party favors. It's all organized for you so that you can pick and choose among the many ideas that were assiduously displayed by the creative Martha by Mail design team. It is to these hardworking individuals, as well as to Martha Stewart, that we owe all of these wonderful ideas and images. "It's not how we like people to think of us, this desire to terrify friends and neighbors, gorging on candy, creeping from house to house and making mischief. But then, it's Halloween, and we believe in making the most of it." 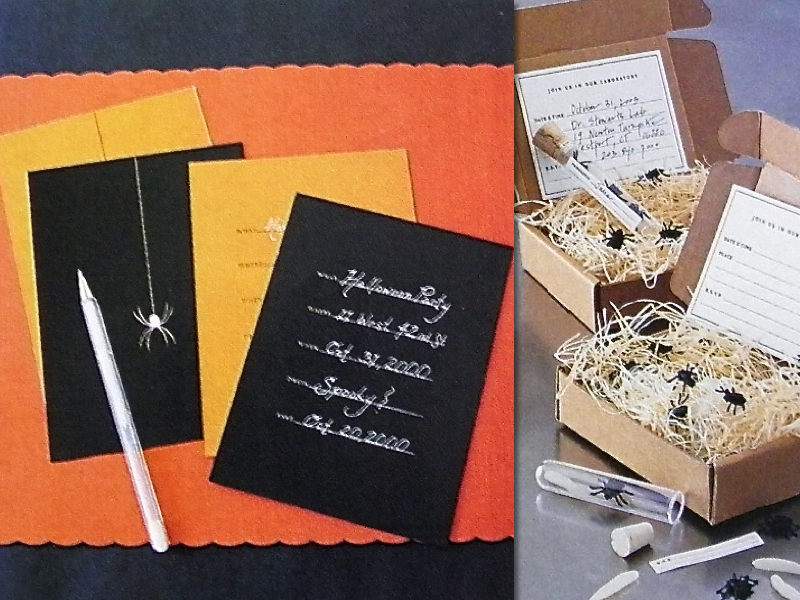 Give your list of invitees a gruesome 'severed finger' inside a box with the date, time and address of your Halloween party. This 'Don't Forget' invitation was inspired by a crafting project in Martha Stewart Living magazine. To recreate this look, use molding gel to cast your very own finger and then mix casting stone following manufacturer's instructions, creating sets of fingers. Tie each with a black ribbon and then set inside a box filled with faux moss. Using colorful cardstock, you can make easy invitations that don't require much time. The "bug kit" uses shredded paper, test tubes, and an infestation of plastic bugs. Creepy, crawly fun! I love the look of these handmade cards. 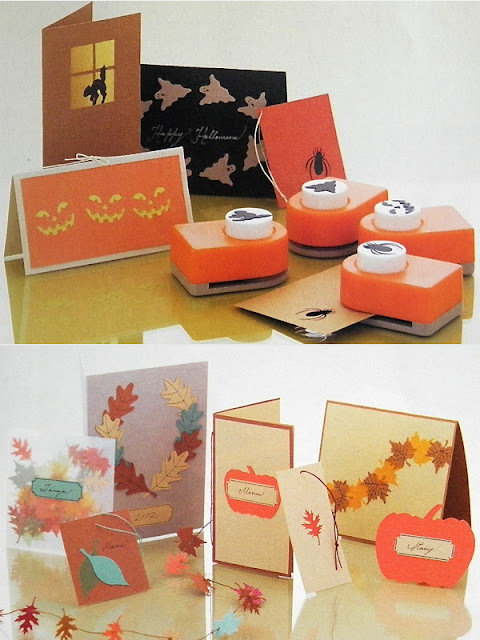 Using autumnal-colored craft paper and craft punches, you can make all sorts of magical invitations for guests. It's all about using your imagination and personalizing your invitations. If you do plan on making your own invites, add moons, pumpkins, spiders, spiderwebs, fall leaves and scaredy cats in order to set the tone of your Halloween party. People are going to love them. Once your invitations have been sent, then it's time to decorate the outside of your home. 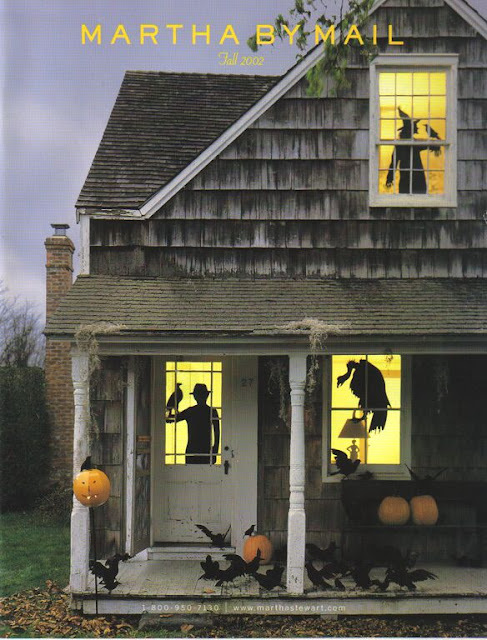 A few well-placed pumpkins on your porch, some jack-o'-lanterns sitting on an old bench or chair, a few faux ravens perched on a mailbox and perhaps some window silhouettes on the front windows, will make your home look very creepy for the season. Although these can be found at most Halloween party stores, back in early 2001 or so, life-size window decals were somewhat of a novelty. The Halloween cat, the lurching zombie and that evil witch really enhance each of these windows nicely. 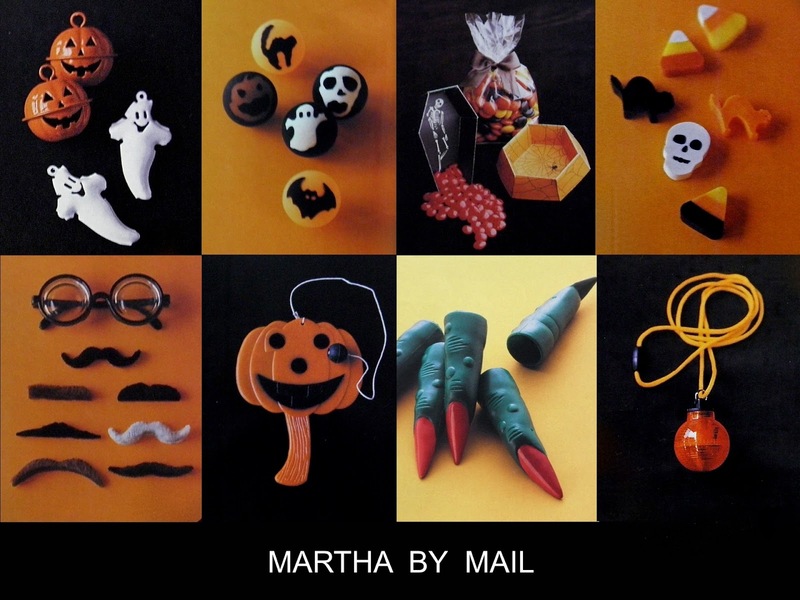 The Halloween issues of Martha by Mail (later becoming The Catalog for Living), were eagerly anticipated by many of us every year. The front covers provided so many great ideas back then and many who were able to purchase from the catalog are lucky enough to still use these great products. This particular home is festooned with spiderweb lights, punched out luminarias, bales of hay with rats and ravens crawling all over them, and enticing pumpkin lanterns. Imagine walking up to this house! Fake tombstones littered with "human bones" and the vultures who have picked them clean, get a boost of this creepy ambience by flying ghosts and old metal chains. Add some perched owls or ravens and you have a graveyard with a menacing feel to it. Bales of hay with faux crows and ravens look like something out of a Hitchcock movie. Readily available at Halloween outlet stores and online, a flock of these birds can greatly enhance your porch. Don't overlook them for the inside spaces of your house. These 'Creatures of the Night' are quintessential for Halloween. The Martha by Mail versions were made with real feathers and wires for claws so that they could be mounted on branches, mantels and chandeliers. 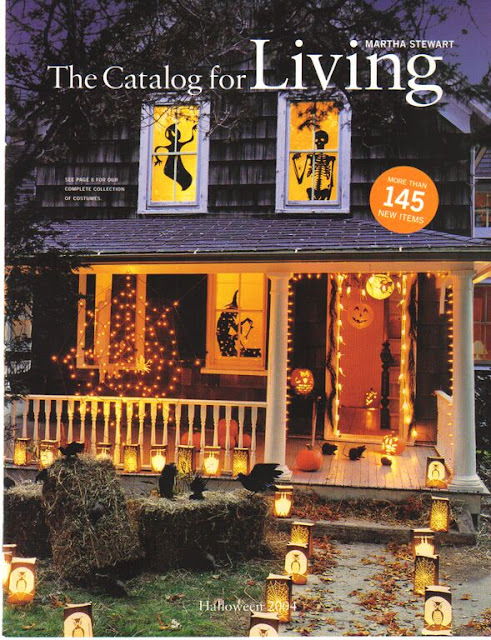 Taken from one of the last Halloween catalogs, the porch is guarded by a pair of life-sized mummies. A child dressed in a bat costume stands alongside crawling rodents, giant bats, bat garlands & luminarias. Trick or treat! The Life-size mummy was draped in gray gauze that made it look 1,000 years old and came in two pieces for easy assembling & storage. A giant spider hanging from a black web looms over a table full of treats. Candied apples, tubs of treats and candies are ready to be given out to trick or treaters. This set up is nice if you plan on having an outdoor party or a block party in your neighborhood. This porch scene introduced us to the 'Birdcage Window Silhouettes' which included a vulture, tropical bird, reaching talon and bird with worm. Made of a plastic film material, the silhouettes were easy to mount and remove. Flicker flame lighting, available at Halloween outlet stores, add some spookiness to the covered porch. The 'Scary Luminarias' were always a favorite of mine. Made of fire-retardant material, the bewitching bags made it easy to light a driveway or walkway. Each were made to be filled with sand for anchoring, and be lit with battery-operated lights. The designers and editors of Martha by Mail were always busy coming up with new products. Stencils played a big role in many catalog products, such as their pumpkin carving kits. How eerie is this set up of carved pumpkins with Halloween silhouettes of a witch, cat, spider and flying bats? The pumpkins can be placed on a dining table like this or they can be set on a sideboard with dessert. 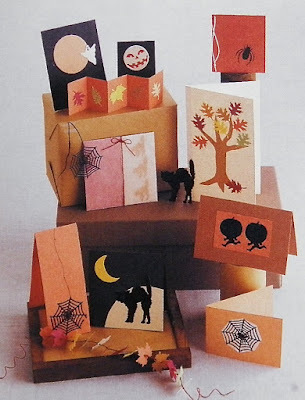 This particular kit was called 'Pumpkin Carving and Halloween Printing Kit', and was inspired by a story in Martha Stewart Living. The templates were meant to be used to carve out the silhouettes, which were then painted with water-soluble acrylic ink. This made it possible to paint treat bags with the same design. Carved out pumpkins and a 'Pick-a-pop' pumpkin are easy to make and fun to display. For the pumpkin on the right, simply poke holes along the sides of a "funkin" and insert lollipops of your choice. Guests can then take what they want. This is a classic photograph from Martha Stewart Living. The templates were offered with the 'Ultimate Pumpkin Carving Kit. This kit included: a scraper, double melon-ball scooper, 3 hole cutters, keyhole saw, chip-carving knife, linoleum cutter, wax pencil, and needle tool; canvas holder; 6 templates; 8 sheets of glassine; 2 lights; and color instruction booklet. If you have one, consider yourself lucky. These pumpkins are so wonderful! This front stoop is wonderfully decorated with an array of pumpkins. With a few simple tools from a hardware store, you too can have something like this. Aren't these great? Having a variety of shapes, sizes and styles of pumpkins makes any entrance interesting. You don't have to do the traditional triangle eyes, nose and gap-toothed mouth for your jack-o'-lantern. One of the secrets to these shapely pumpkins is using a rubber mallet to punch out shapes with Halloween cookie cutters. Once your guests have been bewitched by your spooky front porch, it's time to give them even more of a hair-raising experience indoors. A large, bubbling cauldron, skeletons, skull candles and specimen jars make this table seem to belong to a coven of witches. A round table set against a corner is draped with a black spider-web design tablecloth. 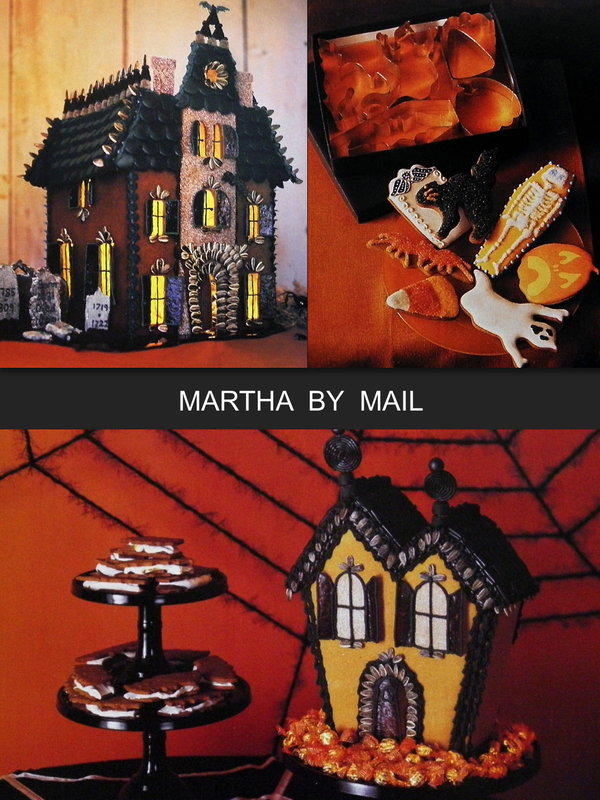 Black cake stands hold "batty smores', sugar cookies, paper bat cones filled with candy and a 'Haunted Mansion'. Giant spiders, spiderwebs and spider garlands complete the scene. The Haunted Treat Tree was featured in several of the Halloween issues. Its clever design made it possible for you to hang Bat Treat Cones, cookies or other ornaments. Full Moon Lanterns hanging overhead, jack-o'-lantern folding fans set on a wall, papier-mâché treat cauldrons on the table, spooky spiral yo-yos, plastic skeletons, and licorice cats create such a sweet buffet area. Oh, don't forget to have black toothbrushes for kids to take home with them when they've finished eating their fill. Here is the Haunted Tree once again. If you're a skilled woodworker or know of one, I'm almost positive this could be created with a simple template or two. How much fun would it be to create a mad scientist's lab for your Halloween party? This one created by the Martha by Mail team had apothecary jars filled with 'specimens', skeletons, skulls, bone candles, faux ravens, and a bubbling cauldron. The individual standing there was wearing "Dr. Stewart's Mad Scientist Costume". Life size skeletons or skulls can be purchased online or at Halloween outlets. One will make anyone stop dead in their tracks. Two or more will have people shrieking! This dessert table has carved 'funkins', treat-filled cauldrons, boxed finger invites, cupcakes with bone candles, a few 'crazed cats', and menacing vampire bats. The bat garland attached to the table completes the look. Dare you take a treat? This fireplace is overrun with creatures of the night. They're perched on the mantle, on top of branches, the small side table and on the skeleton's clavicle. Bone candles set on shrunken heads (peeled and carved turnips & apples) and apothecary jars filled with specimens add to the creepiness. A large fishbowl (they can be found at craft stores) is filled with slime and insects. Eek! Add a bit of whimsy with some spooky piñatas in the shapes of spiders, bats and pumpkins. 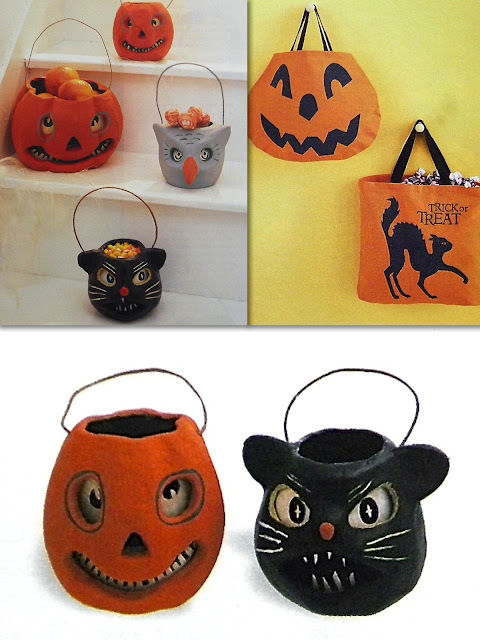 These are made from papier-mâché and crepe paper, and can hold up to 3-1/2 pounds of candy. Give the kids a skeleton bone to break the piñata open. Look at this unearthly scene. More creatures of the night, gourds, candles, a pie and fishbowls filled with punch and treats are simply tempting you to grab a sweet and run for your life. Wicked fun! From a Martha Stewart Living magazine story in the October 1998 issue, crepe-paper costumes found their way into the Martha by Mail catalog. Whether it was a monarch butterfly, a flower in bloom or a pea pod, each kit was easily assembled into a costume. These can skillfully be recreated with a few materials. Get crafty this Halloween and delight the little ones with some colorful costumes. From Martha Stewart Baby magazine, the Goldfish Costume instantly transforms baby into an adorable fish. The costume consists of a soft fish hat and a matching sleeveless bodysuit with velcro closure that opens in the middle (so the wearer's legs can slip out and crawl). The Skeleton Costume is a one-piece black velour bodysuit with appliquéd vinyl bones. With a zip closure in front, attached hinged mittens, foot covers that rest on the child's shoes, this costume can be worn for several Halloweens. 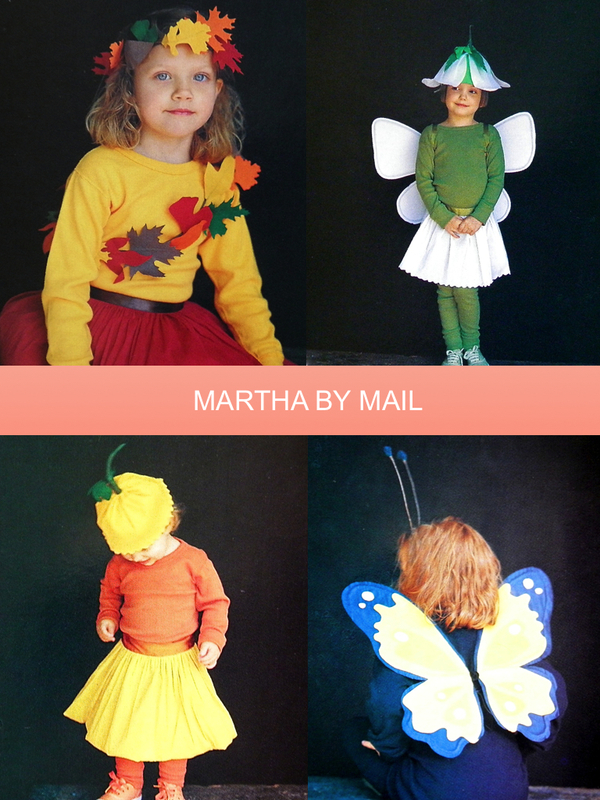 Among my favorite costumes from Martha by Mail are these three. The Turkey Costume, the Bat Costume and the Chicken Costume are such charming creations. Turkey Costume: perfect for your little gobbler, this turkey costume is inspired by an idea from our magazine. From the brown feathered crown to the tiny red feet, the felt-and-velour costume is soft, comfortable and uniquely adorable. Includes tail feathers; breastplate; red "wattle" neck piece and shoe covers; and brown jacket, pants and hat. Bat Costume: Includes a black cape with velcro wristbands, pants, jacket and hat. Ears, collar and cape have orange accents. Chicken Costume: Why did the chicken cross the road? To go tick-or-treating of course. This costume, based on one our most popular ideas from Martha Stewart Baby, includes a long-sleeved tee covered with real fluffy white feathers, cap with red "comb" that ties under the chin, orange pants, and yellow vinyl foot covers (so kids can wear their own shoes). 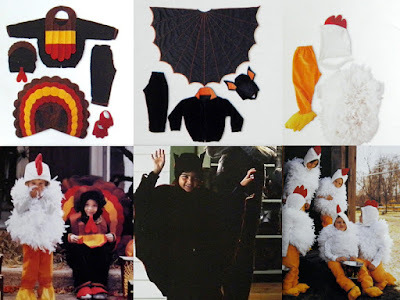 This costume kit was an all in one idea from the pages of Martha Stewart Living. 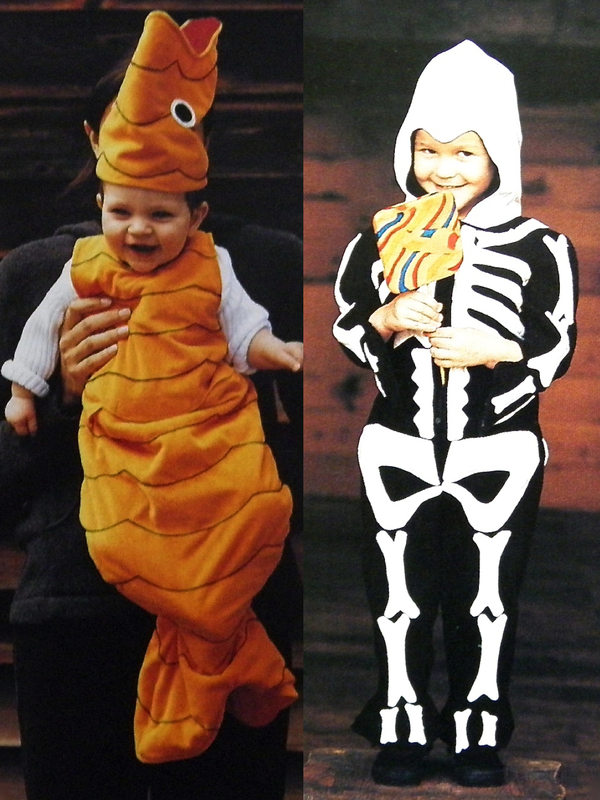 The Baby-Costume Kit made it possible to dress up a child as a devil, tiger or ladybug. A black creeper provided the base for the costume. Along with patterns for tracing and cutting, the kit came with wool-blend felt, pipe cleaners for antennae and fabric glue. Adorable! This family of trick-or-treaters is ready to venture out. On the left we have father and child bats, and on the right we have a mother and child spider. What fun! The Mummy Costume was a combination of gauzy strips sewn onto pants, mittens and a hooded jacket. So cute. Dr. Stewart's Mad Scientist costume is such a simple get up. With a lab coat, and some black rubber lab gloves, the scientist's funny look is enhanced with thick eye-distorting glasses and set of repulsive teeth. Cupcakes never go out of style, and for a Halloween party, they may be just the thing to have. Sitting atop a caramel-colored cake stand, an assortment of cupcakes iced in buttercream tinted orange and chocolate looks scrumptious. Each treat gets topped with sprinkles in a variety of Halloween shapes. Many of these jimmies can be found at supermarkets, baking supply stores and even craft stores. The old-fashioned treat picks add to the charm of the enticing sweets. If you source a variety of cupcake paper liners for your Halloween party, include some with prints on them to create visual interest. They look wonderful. An easy alternative to the dessert buffet is to have single layer cakes decorated with a simple sprinkling of powdered sugar or cocoa powder. If you use cake stencils (this was a trend that Martha Stewart started), you can create spooktacular cakes that everyone is going to want. Don't forget to buy a few pots of powdered food coloring if you want to tint the confectioners sugar. We can't mention Halloween without having some cookies. Admittedly, my cookie craze began because of Martha Stewart and Martha by Mail. With those Halloween Cookie Cutters (Set I and Set II) or the Bat & Owl Copper Cookie Cutters, you can cast a spell on your guests, as well as trick-or-treaters, by creating iced sugar cookies which can be placed on platters or into clear cellophane bags. Give these only to individuals that you personally know. Halloween Cookie Cutters Set I: ghost, candy corn, pumpkin, coffin, cat and bat. Halloween Cookie Cutters Set II: bone, broom, raven, spiderweb, cauldron, witch's hat and owl. Look at those clever tuile cookies sitting on drabware fruit saucers. Tinted tuile batter can be spread between stencils in the shapes of ghosts, cats, pumpkins and bats; bend and shape as soon as they come out of the oven. How magnificent are these Haunted Mansions? Sunflower seeds, licorice candies, royal icing and other sweet edibles can greatly enhance a spiced sugar cookie base in the shape of a house. All this is is taking the concept of a gingerbread house and applying it to a spooky Halloween abode. Make it creepy, make it look haunted and make it look enchanting. Set it on top of a black plate or black cake stand. Those Batty Smores are nothing more than graham cracker cookies cut out with a bat cookie cutter, baked and sandwiched between a hot marshmallow and a piece of chocolate. Delicious! The top right photo shows you the Set I of the collectible tin cookie cutters from the catalog. Cakes are always welcomed at any dessert table. The collectible pumpkin cake mold creates a three dimensional cake, complete with stem, veining and gourd sections. The baked cake can either be finished with a simple glaze or it can be iced with colorful buttercream. Attach fondant leaves dyed in autumn colors or add some creepy crawlers all around the pumpkin. The small spider cupcakes are nothing more than baked half-spheres (these molds can be found at baking supply stores) covered in buttercream and black sprinkles. The head and legs of the spider are baked meringues. You can improvise and skip baking meringues and use licorice for legs. Another great idea is to host a cookie decorating party for your Halloween goblins. Have baked cookies in the shapes of ghosts, cats, monsters and what-not, then set out bags or squeeze bottles filled with tinted royal icing. Don't forget to have sanding sugars, sprinkles and other candies handy so that kids and adults can enhance their treats according to taste. Yum. Handmade lollipops are meant to crafted by adults, since it involves boiling sugar. Source lollipop molds from your favorite baking supplier and create multi-flavored candies for your party. Set them on top of a flower frog (top left) and let your guests choose which ones they want. You can also wrap each lollipop in a cellophane wrapper and hand them out as party favors. This was such a wonderful kit and idea from Martha by Mail. Let's not forget a Martha Stewart signature Halloween party nibble. Witch's fingers! Make pretzel dough and shape into fingers. Tint blanched almonds with red food coloring and attach to the ends of the pretzel fingers. All that is left is to do is to sprinkle each finger with salt and some dried rosemary for "knuckle hair", and then bake in the oven. People are going to love these gruesome fingers. I've never used these cookie cutters to make marshmallows, but why not create some using your favorite Halloween cookie cutters? The finished marshmallows can get dredged in colorful sanding sugar and get placed on platters for guests. I love the spooky cats and pumpkin. Remember the Haunted Tree? This one is adorned with tuile cookie ghosts. How great is this idea? Add some Bat Cone Treats and you have yourself a sinister tree ready to adorn any dessert table. Don't forget to add some buildings here and there to create a haunted village. Boo! Party treats and party favors don't have to have sugar and calories. 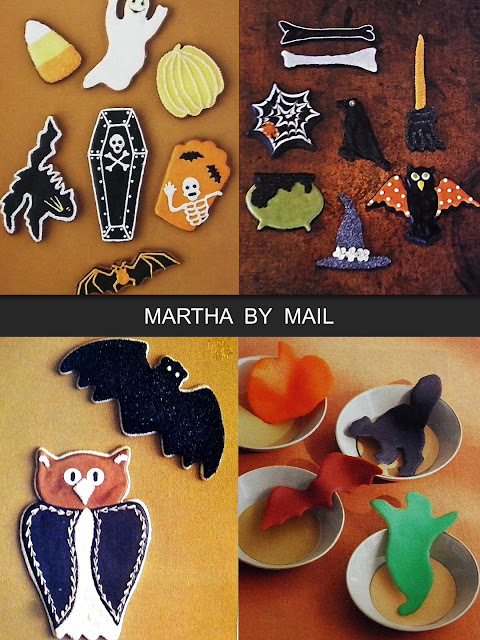 If you want to have healthier alternatives, use these ideas from Martha by Mail for Halloween party favors. 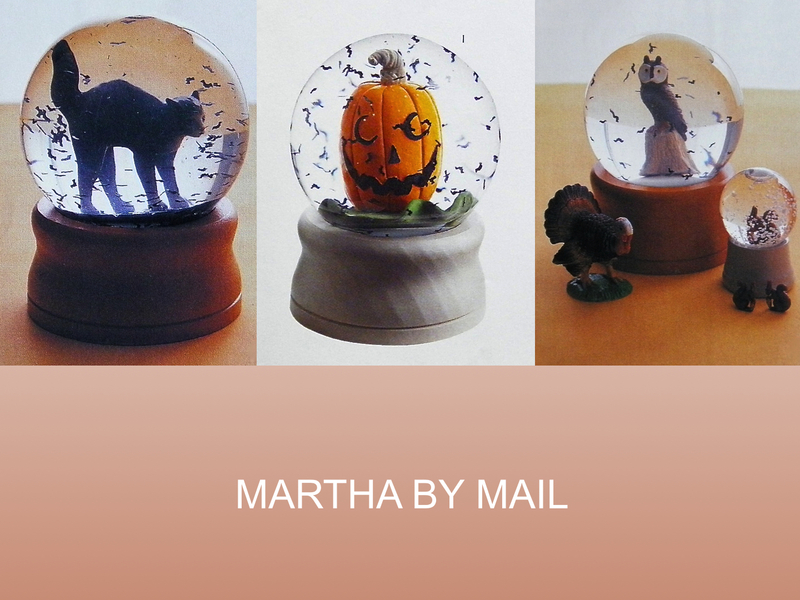 We have snow globes with Halloween-themed figurines for lucky individuals. A crazed cat, a jack-o-lantern and some owls look entrancing in their water-filled spheres. Add some bats to shake up (this is the "snow" part) and create a ominous scene. Any exclusive design from Martha by Mail, this plump spider was handmade by the German toy manufacturer, Steiff. Complete with mohair body and legs, each spider had the signature brass button and label authenticating it. Every once in a while, these creep up on auction sites. If you buy an assortment of party favors you can let the ghouls and beasts choose their own. Halloween erasers, instant disguise accessories (mustaches and eyeglasses), dead ringers (jingling bells in the shapes of pumpkins and ghosts), paddle game pumpkins, witch fingers, Halloween favor cups and trick-or-treat safety lights are great little loot pail stuffers. Keep it frighteningly fun. More party favors means more fun. 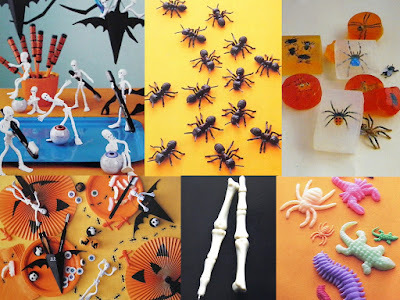 Bendable plastic skeletons, an infestation of ants, handmade glycerin soaps with embedded spiders, googly-eyed erasers, toothbrushes, finger bone pens and creepy crawlers that expand when wet, are just some of the Halloween-inspired favors that can enhance your party. Black and orange treat bags sealed with Halloween stickers can conceal any number of treats. Candy corn, creamy pumpkins, handmade marshmallows and hard candies can get filled in these and get handed out to your multitude of beastie guests. Don't forget to have cellophane-wrapped popcorn balls and iced sugar cookies (black cats are great!) for gift giving. If you want to be a nice host, make sure you give each guest their very own loot pail or bag to take their spoils home. The canvas totes can still be found at craft stores, but I've also seen felt versions at the supermarket (try Whole Foods, because they have quite a few Halloween goodies). 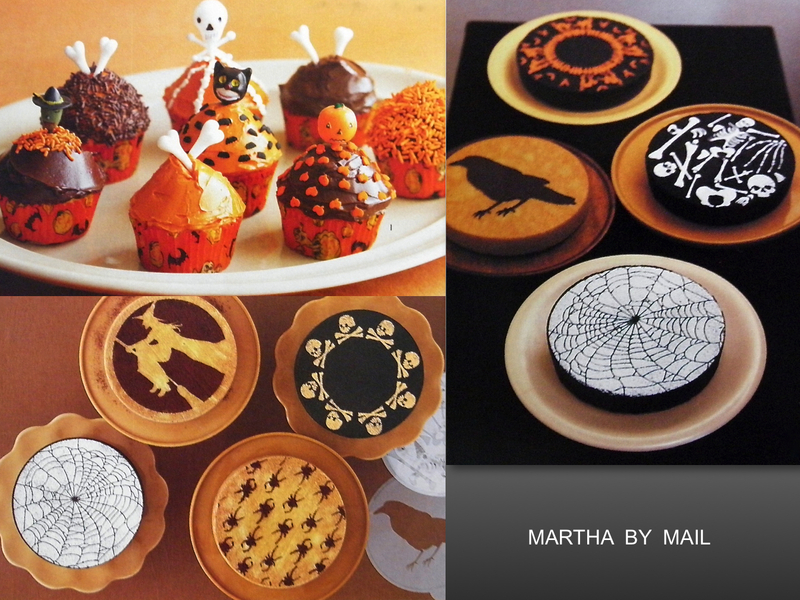 The papier-mâché cauldrons are perhaps my favorite treat pail designs from Martha by Mail. These were meticulously styled after lanterns that were popular in the 1920s. The catalog had them in small pumpkin, large pumpkin, small cat (my favorite! ), large cat, and owl. At the stroke of midnight on Halloween, I hope that all of you will be having a ghoulishly terrific time celebrating the season. Whether you take one idea or two from these Martha by Mail photographs, make your celebration a festive one. If you're lucky enough to own some of these Halloween-themed items from the catalog, I highly encourage you to use them this year. I have a few cookie cutters and cake molds I need to take out of storage to help me create some hair-raising treats. How will you frighten up some Halloween fun this season? Those window silhouettes are very effective David. Is this your house? I love those window silhouettes too, but they aren't mine. This reminds me that I need to find some for Halloween! Thank you, David, for curating such a wonderful collection of MBM Halloween! I definitely remember swooning over some of these pictures years ago! You're very welcome, Kristin. I'm glad you appreciate it. Oh, I know, going back through these images as I was gathering them made me feel so nostalgic. I can remember ordering this and that from the catalog, and waiting for it in the mail. Good times! What a fantastic post, David! I waited especially until today to visit, because I knew I'd have time to read every word! And, how great to find my patience rewarded with such a fantastic post! Although I (sadly) no longer have any of these catalogs, I remember thumbing through them and a lot of these images as if it were yesterday. I cannot help but regret everything I didn't buy every time I think about Martha by Mail. After reading your post I am now officially ready to let summer go and to welcome Halloween and the holiday season. Thank you for this delightful nudge in that direction! Janet, I feel exactly like you do. Every time I go through past issues of this catalog I can remember thinking about everything I wanted to buy. Like you, I regret not getting certain things, but I'm grateful for what I did buy. Yes, summer is over and fall is here! By the way, I want to get your Oma's apple kuchen recipe to try here at home. I hope you have it handy!